Nova mineralization is in the form of a magmatic nickel sulphide deposit. 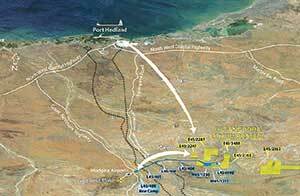 Sirius Resources reported in late January that construction is under way at its 100% owned, underground Nova nickel mine near Norseman, Western Australia. Project development is based on a definitive feasibility study released in July 2014. At full production, the mine is expected to produce an average of 26,000 metric tons per year (mt/y) of nickel and 850 mt/y of cobalt in a nickel concentrate and 11,500 mt/y of copper in a separate copper concentrate. First concentrate production is planned for the fourth quarter of 2016. Mill throughput at design capacity will be 1.5 million mt/y. Initial mine life is planned at 10 years. Capital cost to develop the project is estimated at A$443 million. 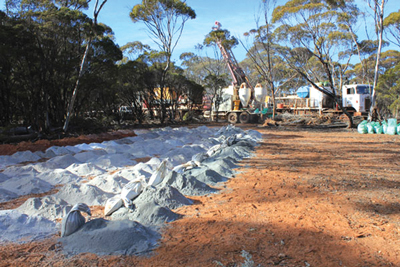 Nova mine development is being undertaken by underground mining contractor Barminco under a three-year contract valued at A$129 million. A boxcut is being opened to provide access to fresh rock for driving of a decline to access the mine. The contract includes initial mining of the Nova orebody. The Nova deposit is a magmatic nickel sulphide deposit. The initial probable ore reserve totals 13.1 million mt grading 2.1% nickel, 0.9% copper, and 0.07% cobalt, containing 273,000 mt of nickel, 112,000 mt of copper, and 9,000 mt of cobalt. Approximately 83% of the planned production will be from sublevel open stoping, with the remaining 17% produced from longhole echelon retreat stoping. Ore and waste will be hauled in 60-mt underground trucks up a straight, one-in-seven gradient decline. The decline has been designed to allow conveyor haulage to be retrofitted at a later date if deemed appropriate. The processing plant will utilize a conventional crushing process, with a primary crusher fed from stockpiles by a dedicated front-end loader. Grinding by an open-circuit SAG mill will be followed by a ball mill in closed circuit with hydrocyclones. Flotation will be through roughing, cleaning, and cleaner scavenging open circuits, which will be replicated for copper and nickel. Regrinding on particular streams will be used to increase liberation and recovery for both circuits. The Nova exploration camp is being expanded and converted to become a 200-person temporary construction camp to house the workforce while the permanent accommodation village is being built. The permanent accommodation village is scheduled for completion in August.